Replaced original SO012.AGF file with translated one. Everything except dialog and fishing instructions is translated to English. 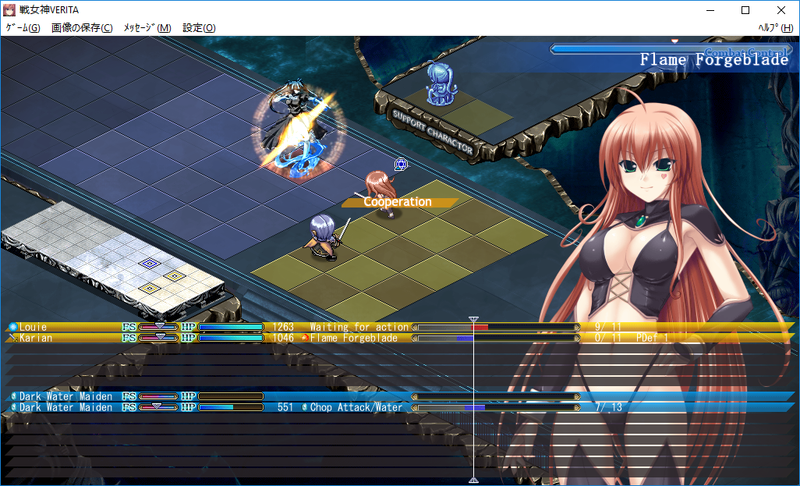 The game takes place some time after Ikusa Megami ZERO and immediately before Ikusa Megami MEMORIA. If you find any game-breaking bugs, leave a comment to let us know. Due to extreme lack of space, character information and terminology may sound a little strange and may not have punctuation at the end of sentences. Patch was made for game with Appends 1, 2 and 3 and 2.0 patch but should work for any combination. If you are not running version 2.0, dont place SO018.AGF and place SO017-1.0.AGF instead of SO017.AGF and rename it SO017.AGF. Some dialog choices are also translated, these are the files beginning with SC or SP. The bar at the top of the window isn't translated but all those options are accessible via in-game menus. After installing the base game, Append Disks 1-3 and/or 2.0 patch, backup all .AGF and .BIN files in the game's folder. Unzip the contents of the interface patch to the game's folder. Will you not consider do the same translation that you did with ZERO? If you mean translating dialog, no. ZERO's dialog translation wasn't done by us, it was by nekoHen, but we merged the patches together. Did Nekohen ever do a dialogue translation for this one? Translate Sankai Ou no Yubiwa pls! I'm sorry but that's probably not going to happen due to our lack of interest in the game. However, a patch for the upcoming Amayui Castle Meister is much more likely, it will probably take some time though. Thank for your effort translating game! i'm looking foward it! Thanks for the patch, but I have some few problems, in the two pictures above, the statistics like "Atk Pow" and so on are translated, same for "waiting for action". However in my game, it remains untranslated. It's not a big deal but I want to know if it's normal. It appears I accidentally included the original file rather than the translated file relating to those terms, I have uploaded a version with the correct file included (v1.01) check the updated link. Thank you, it's better now. However, I still have the "waiting for action" untranslated but I saw someone on youtube who did not have this problem. It's just a small, unimportant thing but do you know where this problem comes from? That is odd, have you perhaps installed the game patches after the translation patch? The "Wait For Action..." text that appears when you right click in a battle during someone's action is in the file SO007.AGF, I guess you could try copying it from the patch archive again. It's not important for the comprehension. I give up. Tenbin no La DEA. ~Ikusa Megami MEMORIA~ .What will you be improving? anyone have links for append disk ? It happens sometimes on non-japanese systems, you can just press yes to continue the game. If it gets too annoying, there's a patched exe that stops that error from appearing in most eushully games, you can download it from here http://www.2dfan.com/downloads/6969 (it's called "AGE Patch.exe"), just put it in same folder as the game and run it. though I have got ap1 (from LUNCHBOX), update 1.07 and 2.00, will there a problem applying the patch without running ap2 and ap3? one of knowledge how to internet. search on google by other language. eg; russian. goodluck for those who read this. where did you get ver 2.00? Mind sending the file to me? so guys ive played battle goddess zero, whats next according to the story ? zero > verita > memoria ? I'm unable to locate Append 3 so without that I run into an error when trying to play it with the Interface Patch installed which prevents it from playing, removing the patch allows me to play it. It doesn't even look like you can get Append 3 anywhere not even on official sites related to Eushully. Is the 3rd Append disc really needed (if even exists since I can't find any mention of it anywhere)? When I try to use the Interface patch with Append 1 and 2 and 2.0 Patch I get an error in Japanese about needing to reinstall the game. Looks like the only way to get Append 3 is via the Bug Bug 2011 April issue Magazine, it comes with a DVD containing Append 3 for this game. 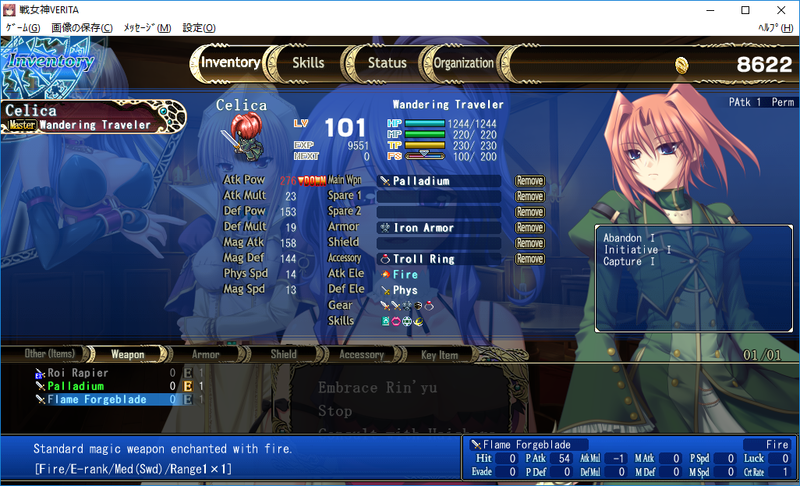 Until I can get my hands on Append 3 I probably won't touch this visual novel since I can't use the Interface Patch without Append 3.